This unit is the professional's choice, and the only hot knife used in the Skin Boat School for over 20 years (first one still working without service). Simply the best hot knife in the world. Perfect for skin on frame boat building. Comes equipped with 2 led Head lights for precise work. 60 watts producing 1200 F degrees of heat. Trigger action provides heat on demand. Reaches cutting heat in seconds. Will cut through a 2x4. The unit is designed to cut and seal synthetic fabrics, line, cord and webbing. NOTE: This unit is stocked with a 110 voltage for use in North America, but it can also be special ordered with 220 for worldwide use. 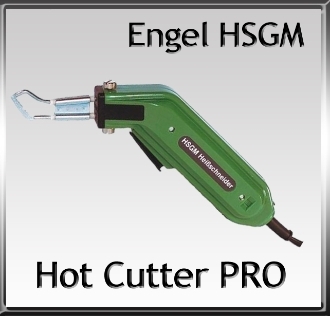 CAUTION: The Engel Hot Knife is designed for intermittent operation and should not be used for more than 20 SECONDS at one time without cutting material.